In my previous post, I wrote about the different ways you could look at Service Lifecycle Management (SLM), which, I believe, should be part of the full PLM vision. The fact that this does not happen is probably because companies buy applications to solve issues instead of implementing a consistent company wide vision (When and Where to start is the challenge). 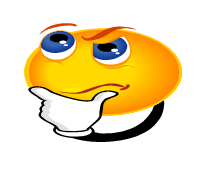 Oleg Shilovitsky just referred one more time to this phenomena – Why PLM is stuck in PDM. I believe PLM as the enterprise information backbone for product information. I will discuss the logical flow of data that might be required in a PLM data model, to support SLM. Of course all should be interpreted in the context of the kind of business your company is in. The first significant differentiation I want to make is between managing an installation or a single device as I will focus only on installations. An installation can be a collection of systems, subsystems, equipment and/or components, typically implemented by companies that deliver end-to-end solutions to their customers. A system can be an oil rig, a processing production line (food, packages, …), a plant (processing chemicals, nuclear materials), where maintenance and service can be performed on individual components providing full traceability. Most of the time a customer specific solution is delivered to a customer, either direct or through installation / construction partners. This is the domain I will focus on. I will not focus on the other option for a single device (or system) with a unique serial number that needs to be maintained and serviced as a single entity. For example a car, a computer device. Usually a product for mass consumption, not to be traced individually. 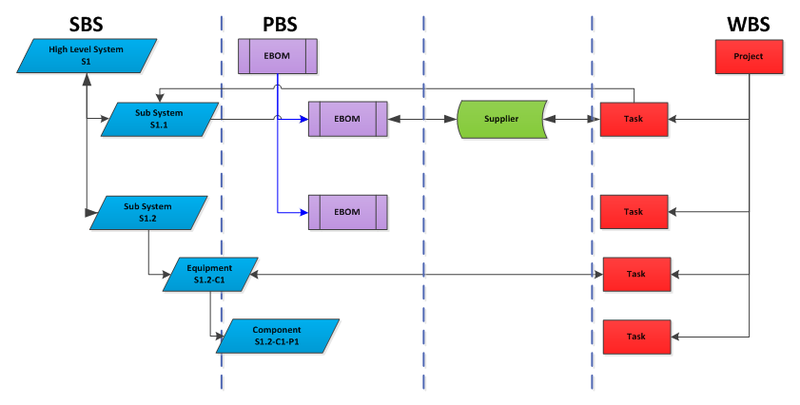 In order to support SLM at the end of the PLM lifecycle, we will see a particular data model is required which has dependencies on the early design phases. Let´s go through the lifecycle stages and identify the different data types. In the concept/sales phase the company needs to have a template structure to collect and process all the information shared and managed during their customer interaction. In the implementations that I guided, this was often a kind of folder structure grouping information into a system view (what do we need), a delivery view (how and when can we deliver), a services view (who does what ) and a contractual view (cost, budget, time constraints). Most of these folders had initially relations to documents. However the system view was often already based on typical system objects representing the major systems, subsystems and components with metadata. In the diagram, the colors represent various data types often standard available in a rich PLM data model. Although it can be simplified by going back to the old folder/document approach shared on a server, you will recognize the functional grouping of the information and its related documents, which can be further detailed into individual requirements if needed and affordable. In addition, a first conceptual system structure can already exist with links to potential solutions (generic EBOMs) that have been developed before. A PLM system provides the ideal infrastructure to store and manage all data in context of each other. Before the design phase starts, there is an agreement around the solution to be delivered. In that situation, an as-sold system structure will be leading for the project delivery, and later this evolved structure will be the reference structure for the as-maintained and as-services environment. A typical environment at this stage will support a work breakdown structure (WBS), a system breakdown structure (SBS) and a product breakdown structure (PBS). In cases where the location of the systems and subsystems are relevant for the solution, a geographical breakdown structure (GBS) can be used. This last method is often used in shipbuilding (sections / compartments) and plant design (areas / buildings / levels) and is relevant for any company that needs to combine systems and equipment in shared locations. The benefit of having the system breakdown structure is that it manages the relations between all systems and subsystems. Potentially when a subsystem will be delivered by a supplier this environment supports the relationship to the supplier and the tracking of the delivery related to the full system / project. Note: the system breakdown structure typically uses a hierarchical tag numbering system as the primary id for system elements. 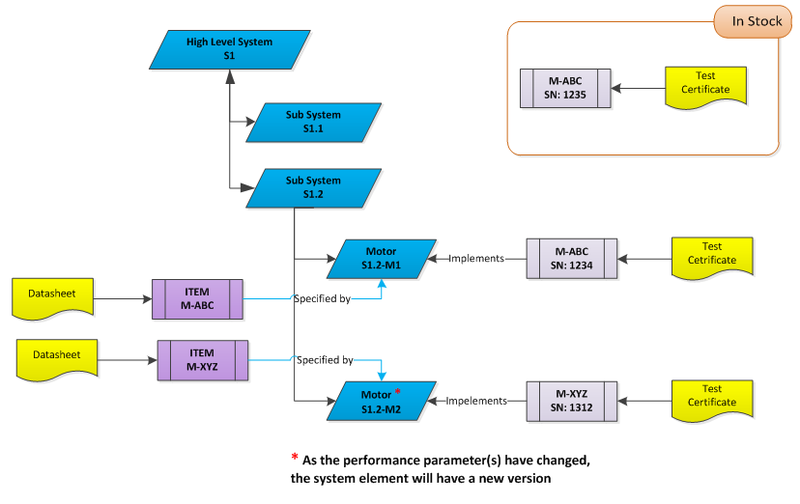 In a PLM environment, the system breakdown elements should be data objects, providing the metadata describing the performance of the element, including the mandatory attributes that are required for exchange with MRO (Maintenance Repair Overhaul) systems. Working with a system breakdown structure is common for plant design or a asset maintenance project and this approach will be very beneficial for companies delivering process lines, infrastructure projects and other solutions that need to be delivered as a collection of systems and equipment. 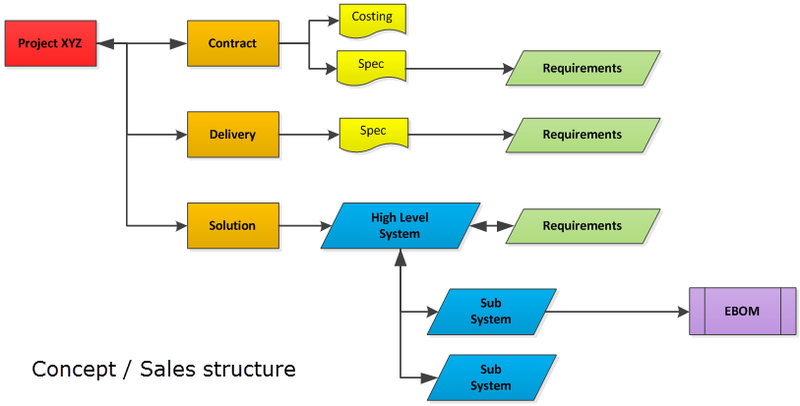 During the delivery phase, the system breakdown structure supports the delivery of each component in detail. In the example below you can see the relation between the tag number, the generic part number and the serial number of a component. The example below demonstrates the situation where two motors (same item – same datasheet) is implemented at two positions in a subsystem with a different tag number, a unique serial number and unique test certificates per motor. The benefit of a system breakdown structure here is that it supports the delivery of unique information per component that needs to be delivered and verified on-site. Each system element becomes traceable. For the maintenance phase the system breakdown structure (or a geographical breakdown structure) could be the place holder to follow up the development of an installation at a customer site. Through the relationships with the BOM items (not all are shown in the diagram), there is the possibility to perform a where-used query and identify other customers with a similar motor at that system position. Perhaps a case for preventive maintenance? Note: the diagram also demonstrates that the system breakdown structure elements should have their own lifecycle in order to support changes through time (and provide traceability). From my experience, this is a significant differentiator PLM systems can bring in relation to an MRO system. MRO and ERP (Enterprise Resource Planning)systems are designed to work with the latest and actual data only. Bringing in versioning of assets and traceability towards the initial design intent is almost impossible to achieve for these systems (unless you invest in a heavy customized system). In this post and my previous post, I tried to explain the value of having at least a system breakdown structure as part of the overall PLM data model. This structure supports the early concept phase and connects data from the delivery phase to the maintenance phase. Where my mission in the past 8 years was teaching non-classical PLM industries the benefits of PLM technology and best practices, in this situation you might say it is where classical BTO companies can learn from best practices from the process and oil & gas industry. Note: Oleg just published a new blog post: PLM Best Practices and Henry Ford Mass Production System where he claims PLM vendors, Service partners and consultants like to sell Best Practices and still during implementation discover mass customization needs to be made to become customer specific, therefore, the age of Best Practices is over. I agree with that conclusion, as I do not believe in an Out-Of-The-Box approach, to lead a business change. Still Best Practices are needed to explain to a company what could be done and in that context without starting from a blank sheet.